IDANAU, Cameroon (PAMACC News) - It is 11 pm in Idenau, a fishing village community located on the coastal fringes of the Cameroon- Nigeria divide. Joan Dione, 58, fish trader in the locality and her two daughters are busy drying fish. Fish business in this renown fishing habour is on the increase thanks to the installation of solar energy that has significantly reduced post post-harvest losses. “We can now dry our fish even at night with the use of solar ovens,”says Dione, smiling. Dione says the fishing community in Batoke and Idenau council areas have been gripped by a frenzy of commercial activities since solar panels arrived some two years ago. Dione’s daughter Sharon, 23, quickly turns on the lights in a store room where they have stocked baskets of dried fish ready for the market. “Now we dry over 25 baskets a day after good harvest. Two years ago, drying this quantity of fish in a day was impossible,” she says. “We smoked fish using wood from the mangrove forest and with limited access to wood our production was less than 5 baskets a day. Some kilometers away, Njombe Ikome, store keeper with the Idenau rural council reflects on how the joint efforts to provide solar energy to the community have changed the lives of the villagers in the area in general. “Our children can now do their school homework thanks to solar light at night and they are doing well in school,” he says. The Idenau and Batoke population are pleased that electricity generated from the sun has finally come to relieve them of energy shortage, yet they remain worried that the effects of climate change are still grounding development in their community. “Prolonged droughts and heavy floods when the rains come are still a big problem to us. It distorts our planting calendar and this affects food crop production, says John Ewang, a 44-year-old farmer in Batoke, about 10km from Limbe in the South West region of Cameroon. John Ewang’s worries are similar to those in many countries in Africa, where droughts, erratic rainfall, floods are wrecking havoc causing high rates of food scarcity and malnutrition. World leaders meeting in Paris at the COP21 in December 2015 agreed that there is urgent need to provide a therapy for climate change. 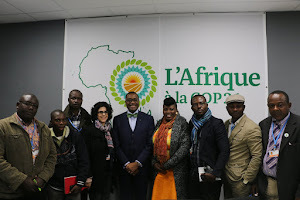 “There is urgent need to provide a therapy for climate change and renewable energy is cardinal to this drive,” Christina Figures, UNFCCC Executive Secretary said at the launch by the UN and partners of a $5 billion initiative to expand renewable energy capacity in Africa at COP21 in Paris France. The UN Secretary-General Ban Ki-moon also told the UN climate change conference (COP21) in Paris that saving energy is a triple-win in the battle against global warming, providing money and ending poverty. “The production and use of energy is responsible for more than half of the world’s total greenhouse gas emissions. That means energy is also more than half of the solution. We need sustainable energy to reduce global greenhouse emissions and avert the risks of runaway climate change,” Ban Ki-moon said, stressing that clean energy is equally important for ending extreme poverty. “Saving energy is a triple-win solution. It can save money, reduce emissions, and provide additional energy capacity,” he added, noting that renewable energy technologies are becoming cheaper and more competitive, with many people accessing energy for the first time thanks to solar panels, wind turbines or small hydro power plant. That new energy policy according to scientists is a switch to renewable energy. The main scientific authority on climate change, the UN Intergovernmental Panel on Climate Change (IPCC) has underscored that renewable energy is one of the major ways of curbing climate change because it is clean and does not emit dangerous greenhouse gases into atmosphere. In addition to its importance to climate change, there’s another compelling reason to develop renewable resources in Africa with a rapidly growing energy demand. As acute as Africa’s energy poverty is today, it could become even worse without aggressive efforts to develop more resources scientists say. The International Energy Agency,IEA ,predicts that even if a projected one billion people gain access to electricity by the year 2040, rapid population growth will mean that some 530 million people will still live without it. And as Africa shifts from a primarily rural society to an increasingly urban one, more of its people will be living middle class lifestyles that require more electricity in their homes and workplaces. With a growing number of people seeking to light their homes and generate power for businesses, farms and manufacturing, the squeeze on resources will become unsustainable unless renewable resources become part of the mix according to IEA. More than 80 percent of the Cameroon’s electricity comes from hydropower, but the government is also encouraging the exploitation of renewable sources, with solar energy gaining ground, officials say. Government statistics show that the industries remain the largest power consumer in Cameroon with 2,781 GWh in 2012, particularly the aluminum (48%) and extractive sectors (18%). Nonetheless, due to regular power outages many factories have invested in diesel generators while over 85 percent of the population that cannot afford such generators pay the price of energy poverty. The dearth in energy supply especially in rural areas in Cameroon has significantly impacted on health, economic opportunities and access to basic services development experts say. According to the country representative of the African Development Bank in Cameroon Racine Kane, the energy sector in the country is presently undergoing important institutional changes, including a reform with unbundling of electricity transmission and completing of a least cost generation and transmission plan. “The African Development Bank is accompanying the Cameroon government in its new drive to improve on energy poverty,” Kane said while presenting a paper at a joint Cameroon-Belgian private sector meeting in Yaounde on February 29, 2016. The Bank, he said, provides an integrated approach along the energy value chain through policy dialogue, institutional development and investments. The fund on December 17, 2015 approved EUR 24 million to fund the production of electricity projects in Cameroon. Statistics from AfDB presented at the conference shows that electricity demand in Cameroon far exceeds supply (especially during the dry season) with the need of around 90 to 100 MW of additional generation per year. Indeed, the current generation deficit has been assessed at approximately 100MW during the dry season with a projected increase in demand of 8% per year until 2035. The Cameroon government says its economic vision 2035 cannot be attained without adequate energy supply, thus the compelling need for additional energy generation capacity that will result in strong development impact. To ease development process, the government embraced decentralization policy over a decade ago to empower local councils economically. But the local government authorities say hydro-electricity supply deficiency is impeding councils from realizing their dream. To breach the gap, the local councils are not only turning to renewable energy to cope with shortfall but are also training their municipal engineers to ensure sustainability and fight unemployment in the country. According to the ministry of water and energy, some 40 local councils have already invested in solar energy as part of a joint effort with the government to narrow the energy gap in the country, especially in rural areas and fight against the impacts of climate change. The Limbe and Idenau local councils are among these. The country lacks the necessary human resource to cope with the increase demand. As a result some higher education institutions in collaboration with local councils are training students to develop entrepreneurial businesses using solar power and other renewable energy technologies. The renewable sector in Cameroon lacks human resources to plan, design, install, monitor and maintain energy systems – but demand is growing experts say. 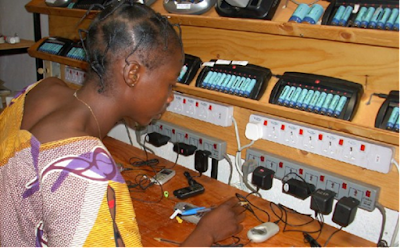 For this reason the ministry of higher education in collaboration with local councils have introduced training programme - dubbed “Solar Technicians Made in Cameroon’’ with some universities and higher institutions running related courses. Cameroon’s Minister of Water and Energy says these specialized training opportunities are needed as a sustainable solution to the economic development deficit in the country, especially in the area of energy supply. Since council authorities gave a nod to renewable energy, development partners have been working in collaboration to support poverty alleviation projects. In 2015 some seven fishing associations in Batoke, Botaland, Wovia, Bonabile, Area Boys Association Down Beach and Fish Monger’s Association of Down beach were offered two solar energy fish drying ovens each by African Resource Group Cameroon, ARG-CAM working in collaboration with the Limbe city council. Council authorities say regular power outage did not only cost the fishing population much in terms of post harvest loss but worst still, threatened the role of the entire coastal area as a destination for tourist and investors. “Even in the CDC camps where the lone hydro-electricity energy supply company, ENEO, provided electricity, it was strictly regulated and limited only to the residents of senior staff. The persistent blackout was a big threat to the role of the entire Limbe coastal area as a tourist attraction,” says Tonde Lifanje Gabriel, Mayor of Idenau rural council. The mayor recalls with a sense of happiness the first day solar panels arrived Idenau. “It was like darkness has been crushed by light. I could not imagine the sun will be our savior,” Mayor Tonde Lifanje said.